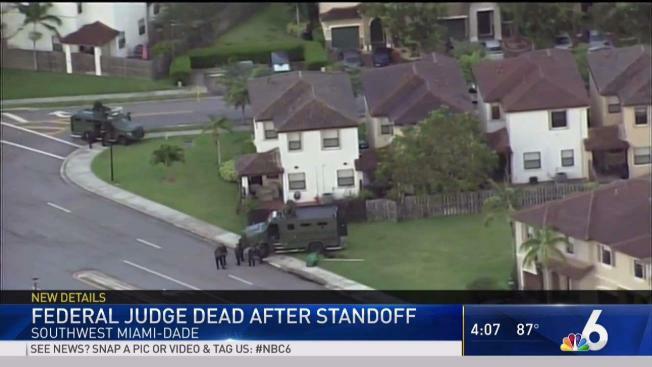 Judge Timothy Maher is dead after a SWAT standoff at a home in Miami-Dade, police said. A federal judge who was arrested last week for allegedly threatening the mother of his child with a gun is dead after he shot and killed himself following a lengthy police standoff at a southwest Miami-Dade home that ended Friday morning. Officers and SWAT units responded to the home located near Southwest 240th Street and 113th Passage late Thursday night after Judge Timothy Maher allegedly took three people including a teen hostage. Miami-Dade Police said a person inside the home texted someone for help, saying they were being held hostage in the home. Negotiators could be heard talking over loudspeakers to Maher inside the home and using the phrase "your honor" at several points. "Tim, I know you’re scared. I know you’re going through a lot," a negotiator said at one point. "Let that girl go. She’s only 13." Miami-Dade Police Det. Chris Thomas confirmed that shortly before 9:30 a.m. Friday officers entered the home after hearing a gun shot. The three people who reportedly had been held hostage were able to get out safely before officers found Maher's body inside. Officials said he died from a self-inflicted gunshot wound. The standoff lasted about 10 hours. "This was an unfortunate circumstance," Thomas said. "They did everything they were supposed to do, they waited as long as they can." Nearby residents told NBC 6 they were forced to evacuate their homes around 11 p.m. Thursday. Several nearby blocks were closed off for hours as a result. Records show the home is owned by the brother of Maher's ex and his family, including a teen daughter. Maher, 51, was arrested at his El Portal home last Tuesday after police say he pointed the gun at his ex following an incident when she came to pick up their child. He was charged with aggravated assault with a firearm, child abuse causing no great bodily harm and resisting an officer without violence. Maher denied the accusations when he appeared in bond court, calling them "horrifically embarrassing." He also told the judge he didn't have a gun on him during the incident with his ex. Officials said officers confiscated dozens of guns from his home the day after his arrest. Maher was a disability judge at a downtown Miami Social Security Administration office.